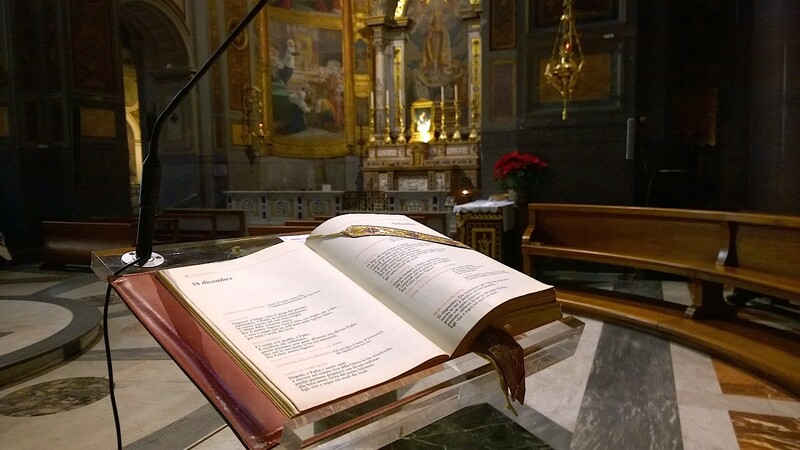 The Vatican on Wednesday published the third set of reports completed by the small circles in the Synod of Bishops. The circles are divided by language groups, and there are four English-speaking circles. These reports regard the third part of the Instrumentum Laboris. Here is a ZENIT translation of the Italian-language “B” group. In the reading of and reflection on the third part (“The Mission of the Family Today”), the Fathers pointed out the need to find a more ideal placement to the paragraphs regarding mixed marriages with disparity of worship, suggesting to harmonize better the theological-canonical title of this reality. In reference to the peculiarity of the Orthodox tradition, it was thought necessary to specify the subject better and to place it in a more congruous part. Beginning from the fact that evangelization is the task of the whole of the Christian people, in the discussions between others the necessity emerged that families, in virtue of the nuptial Sacrament, should become increasingly subjects of pastoral care, expression of a mission that is expressed through concrete life, not something that is only theoretic but an experience of faith rooted in people’s real problems. In this perspective, the presbyters must be formed to recognize this subjectivity, appreciating the competencies and experiences of all, laity, consecrated and ordained. It is also necessary to proclaim the positive meaning of corporeity, language of love that has, as grammar, mutual donation and, at the same time, to indicate the value and the beauty of continence and chastity. The recognition was thought relevant of the resolute, testimonial and supportive value of the variety of ecclesial experiences that are born and work around couples, the family and its prospects. The Synod expresses the experience of listening and speaks with histories: the history of God with humanity (Revelation and its sources) and the history of humanity with its peoples, which we represent. In face of the particular delicacy of subjects concerning this part, it is necessary to protect the balance of the God-history-histories relation. In fact, the Divine Truth and its laws never break these relations, seeking to orient every soul to salvation. Moreover, in the course of the Circle’s work the necessity emerged of giving particular consideration to two important topics: The first concerns all those women that have suffered violence and witness eloquently respect for life and the courage to take on responsibilities, having children resulting from violence to be born and raised, despite not a few environmental and often family threats. The second makes appeal for a particular look of care, which must involve ecclesial solidarity, addressed to those spouses – often husbands and fathers – impoverished by separations. For many the Sacrament of Marriage is a distant horizon; the pastoral ministry must favor the direction, appreciating all that is good in persons and in relations, trusting in the salvific disposition of God and making all the means available to indicate that aim freely. Among the many cases that reveal the necessity of a reflection, which points out the situation of cohabitation carried out also following a civil marriage, is that of a male catechumen and a female catechumen with a baptized and married person, then divorced civilly. At the canonical level, such a situation would be incurable, if at least the marriage of the baptized party cannot be recognized as being annulled. Therefore, the Christian aspirant, finding himself in a situation that does not allow him to access the Sacraments of Christian initiation lives norm the admission to the catechumenate (cf. OICA, numbers 14-17; 68-97), but not the rite of election (cf. OICA, numbers 22-23; 133-151); not, above all, the unitary celebration of Baptism, Confirmation and Eucharist. One can intuit the bitterness of persons that take up the invitation to enter the Church, but see themselves in fact precluded from access in the sacramental form. The concern of the Pastor is to identify and find every valid doctrinal means to help those that have experienced [marital] failure to find the way again to the full embrace of the Church. In regard to the discipline concerning remarried divorced persons, up to today, it is not possible to establish general criteria inclusive of all cases, sometimes very different among themselves. There are remarried divorced persons that apply themselves to walk according to the Gospel, offering significant testimonies of charity. At the same time, it cannot be denied that, in some circumstances, factors appear that limit the possibility to act differently. Consequently, the judgment on an objective situation cannot be assumed in the judgment on subjective “imputation.” The limits and the conditionings then become an appeal to discernment, primarily of the Bishop, diligent and respectful of the complexity of such situations. In that case, to plan itineraries of faith, of pastoral integration and of reconciliation of those that find themselves in situations of stable cohabitation outside of marriage calls for additional reflection. For this reason, the Holy Farther is asked to evaluate the suitability of harmonizing and deepening the complex matter (Doctrine, discipline and law) regarding the Sacrament of Marriage, which also considers pastoral action in dealing with divorced remarried persons. The subject of mercy has gone through the Synod, challenging our pastoral ministry, aware that the mystery of the Incarnation expresses fully the salvific will of God. This divine determination is also entrusted to our mission and to the sacramental means that find their correct hermeneutic in the sense of being an appeal to conversion, support, medicine and help for our salvation. To act as Pastors is to continue to offer the crystalline truth as source of water, participants and empathizers of the tears that, when they are the sinner’s, will be of us all.